Dc or ac power supply. RELTRONICS has released a range of panels meters, multifunction transducers, transmitters and power meters. All the devices come with an option of either dc or ac power supply. The panel meters come with the following functions: V, A, W, VAR, Wh, VARh, pf, Hz, rpm, counter, Ohm, J/K/T/E/S/R thermocouples, RTD. All can be mounted on DIN rails. The power measuring panel meters have ac / dc / trms / Av inputs and can measure 1 or 3 phase system parameters. Some panel meters incorporate various output options such as dc / relay / RS232 / RS485 Modbus RTU. The panel meter range includes meters with a single function or combinations of the above. The transducers come with the following functions: V, A, W, VAR, Wh, VARh, pf, Hz or multifunction capable of measuring 1 or 3 phase systems parameters. All transducers can be DIN rail mounted. The transducers have ac / dc / trms / Av inputs and incorporate various output options such as dc / RS232 / RS485 Modbus RTU. The transmitters come with the following functions: dc-dc converter, J/K/T/E/S/R thermocouples, RTD, temperature, humidity, pulse, position or multifunction capable of measuring 1 or 3 phase systems parameters. All transmitters can be mounted on DIN rails. The transmitters have ac / dc / trms / Av input options and incorporate various output options such as dc / RS232 / RS485 Modbus RTU. 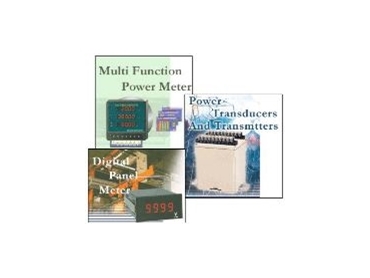 The multifunction power transmitter is a microprocessor-based transducer with a 16-bit CPU and digitised measuring, calibrating and output functions. A multifunction power meter with three LED displays is also available.